Knit these lace gloves with or without fingers! One size: easy lace pattern stitch flexes to fit most. 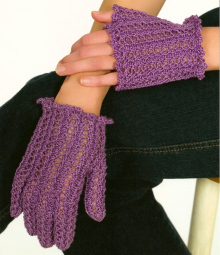 Kit includes pattern and sufficient Finca perle cotton (100% cotton, 2-ply, washable) to complete one pair of fingered gloves. One size. Double-pointed needles not included.